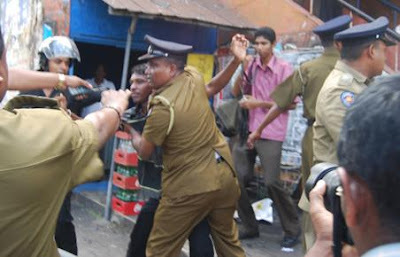 Photo: One of members in Sri Lanka police is doing order from “Chnthanaya” against unemployment graduate. (November, 09, Colombo, Sri Lanka Guardian) We need to remind ourselves that university students, with rare exceptions, have lived off their parents or guardians from birth until they enter university. Thereafter, they receive free education and, in many cases, financial assistance. It is the indirect and direct taxes collected from the poorest citizens to the richest wage earners and other taxpayers of this country that pay for these privileges. d. Extensively damaging university (le. State) and other property. There is no doubt that the vast majority of the citizens of this country and university freshers, look upon ragging as obnoxious in the extreme and frequently dangerous. If a group of citizens outside the universities were to inflict on anyone what the seniors at most of our universities do to new entrants, they would be liable to be imprisoned for assault, unlawful restraint, attempted murder and a host of other criminal offences. The punishment for the other acts listed above would be of a similar level of severity. Our Constitution and the various UN covenants signed by Sri Lanka over the years require that all citizens should be treated equally and that no one group shall be given privileged treatment. It is, therefore, a major violation of the Constitution that the law of the land is not enforced only within university premises. If students behave or threaten to behave in a violent and unlawful manner, the Police have an inescapable duty to intervene and restore law and order. It is unacceptable that successive Ministers of Higher Education have interfered with the Police and given in to the lawbreakers. They have thereby weakened the hands of the legitimate authorities and caused glaring injustices and suffering to be inflicted on thousands upon thousands of helpless students, who merely want to get on peacefully with their studies. Unbearable pain of mind is caused to multitudes of parents who have, in most cases, made enormous sacrifices to enable their children to get into university. We need to remind ourselves that university students, with rare exceptions, have lived off their parents or guardians from birth until they enter university. Thereafter, they receive free education and, in many cases, financial assistance. It is the indirect and direct taxes collected from the poorest citizens to the richest wage earners and other taxpayers of this country that pay for these privileges. This being so, how is it that university students, including some who are attached to various religious orders, are given the right, once they have completed their first year of studies, to break the law with impunity whereas, in similar circumstances, the citizens who pay for the education of these students would be subject to the full might of the law? It is the view of the Citizens' Movement for Good Governance and certainly that of the vast majority of the citizens of this country that violent students should be identified and suspended, expelled or prosecuted just as any other citizen would be for the same kind of offence. We call upon the government to declare that the law will be applied in an independent and fair manner in all sectors of our society without conferring special privileges only on university students. We call upon all political parties to declare clearly and unequivocally that they stand for the Rule of Law and that they will support whatever government is in power to rid ourselves of the small number of criminals and psychopathic demagogues masquerading as students. In fairness to the genuine students who have many grievances, the government must concurrently set up an independent mediation board to whom all such grievances must be referred. In forming these bodies, students should have the right to nominate a member, all University Vice-Chancellors together a second member, the University Grants Commission (UGC) a third member and the Ministry of Higher Education a fourth member. A fifth member, to act as the Chairman of the mediation board, should be nominated by the Constitutional Council (which must necessarily be activated, under the 17th Amendment, without further chicanery). Decisions of these mediation boards should be binding on the Ministry, the UGC, the university authorities and the students.